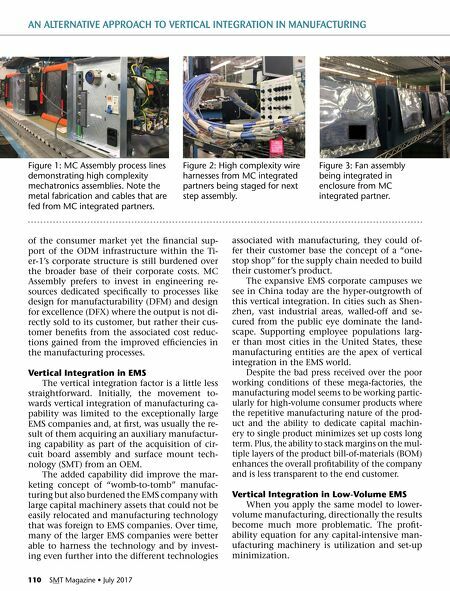 July 2017 • SMT Magazine 111 AN ALTERNATIVE APPROACH TO VERTICAL INTEGRATION IN MANUFACTURING As EMS companies brought in vertical in- tegration, the need to optimize the utilization of their newly gained machinery often out- weighed the needs to support the required ser- vice level of the customer. Obviously, the prac- tice of meeting customer's needs unprofitably is a solution that is doomed for long- term fail- ure for a business. Adding to this is the often- heard statement within these vertically inte- grated EMS companies: "My internal manufac- turing teams that feed me components are my worst suppliers. You would think I have great- er leverage since we wear the same badge but in reality, they are more driven by their own P&L and since I am a captive customer, they know I cannot fire them." Vertical Integration in HMLV When you now apply the same model to the high-mix/low-volume (HMLV) manufac- turing environment, directionally, the results become dismal. This is the environment that MC Assembly matriculates as does most EMS mid-tier companies. Strict dedication of capi- tal-intensive manufacturing machinery is im- possible. Our customer base values flexibility and re- sponsiveness. They look for EMS partners in- stead of EMS suppliers and seek supply chain solutions that integrates their consumption with the EMS Partner's production. 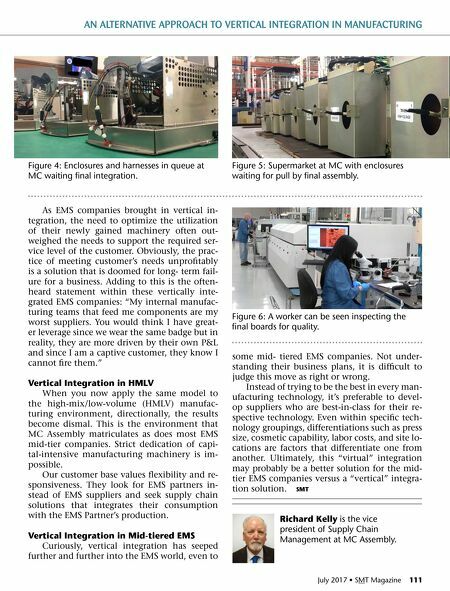 Vertical Integration in Mid-tiered EMS Curiously, vertical integration has seeped further and further into the EMS world, even to some mid- tiered EMS companies. Not under- standing their business plans, it is difficult to judge this move as right or wrong. Instead of trying to be the best in every man- ufacturing technology, it's preferable to devel- op suppliers who are best-in-class for their re- spective technology. Even within specific tech- nology groupings, differentiations such as press size, cosmetic capability, labor costs, and site lo- cations are factors that differentiate one from another. Ultimately, this "virtual" integration may probably be a better solution for the mid- tier EMS companies versus a "vertical" integra- tion solution. SMT Richard Kelly is the vice president of Supply Chain Management at MC Assembly. Figure 6: A worker can be seen inspecting the final boards for quality. Figure 4: Enclosures and harnesses in queue at MC waiting final integration. Figure 5: Supermarket at MC with enclosures waiting for pull by final assembly. Special Coverage — IPC's IMPACT 2017 Washington, D.C.